Okay, we just got back from an arduous road trip. Over 900 miles each way, which took about a day and a half of driving with two squirmy kids strapped into their carseats. We were on a tight timetable, going up to Michigan for a graduation party, but it would have been a much more enjoyable trip if we'd had some free time to explore the route between home and our destination. 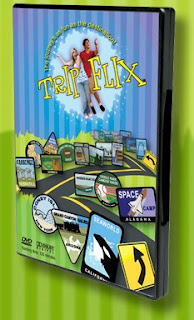 TripFLIX is an interactive DVD that showcases 25 unique destinations across the country. Two teens, Alex and Emily, keep the travel itinerary moving along with witty commentary as kids are introduced to a variety of educational and quirky sites. TripFLIX is a great resource for planning your own family road trip, as well as a way to experience a virtual road trip from the comfort of your own home.